You are here: Home › #oklaed › These Kids Are Awesome! These kids made such on impact on me. I will never forget all of the things that they accomplished this year. 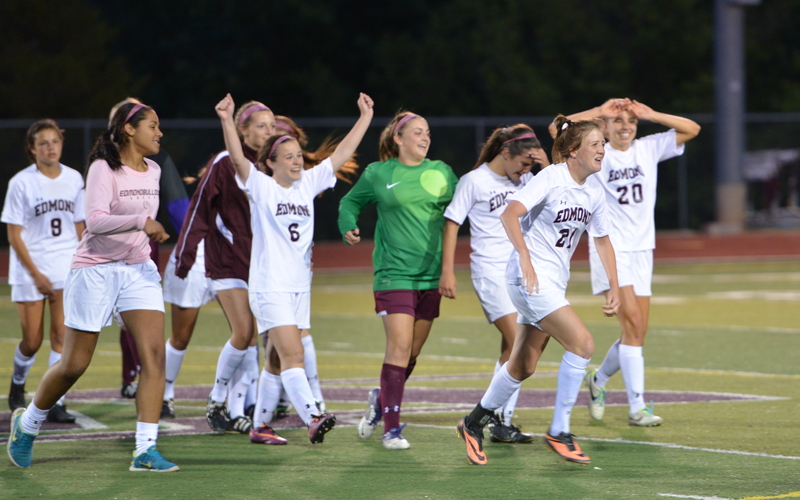 I want to take a few minutes of your time and talk about my family away from home: the Edmond Memorial Girls Soccer team. What a super wild ride – and it was super fun. We, I mean they, started off the year during the fall semester working on speed and quickness and hitting the weights. I knew (every coach knows) this would be a great thing for the girls. At Memorial, we have not had the opportunity to have fall workouts before, but this year that one hour ended up making a huge difference! We got down to the nitty gritty in early January, cold days, sleet, snow storms, frozen tundra – you name it and we saw it this winter. February warmed up a little and we started to dial into the upcoming season. 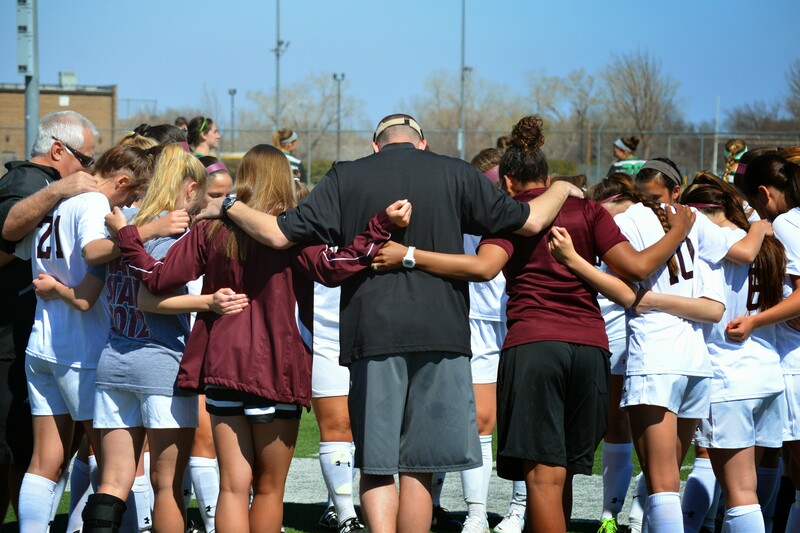 Our first scrimmages were in Tulsa against Jenks and Bishop Kelly and even though we lost both matches – I was encouraged by the performance on the field. The next two scrimmages were against Moore and then against Norman and we just kept getting better – there was a lot of excitement heading into our first game of the year against our city rival Edmond North. We have had quite the heated rivalry with our northside neighbors and this game was no different. However this game was really difficult because there was a huge north wind blowing right down the field (seriously, it was like 40 miles per hour) and made play difficult for both sides and somehow – they scored going into the wind…grumble…opened the season with a loss. 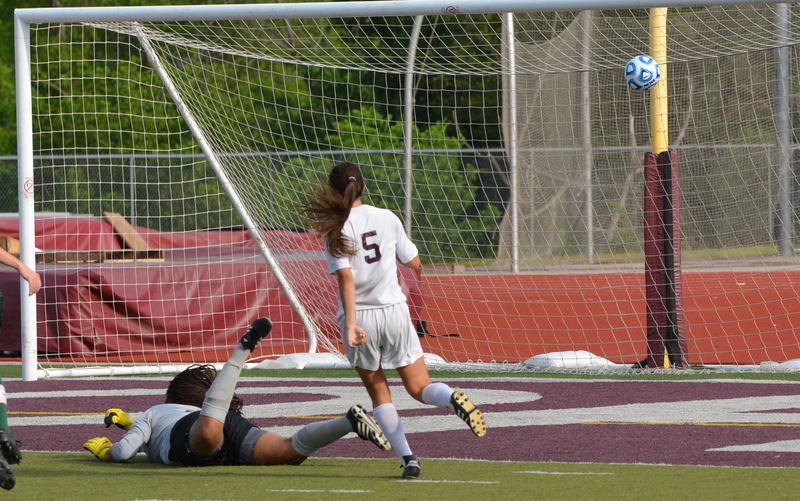 Laramie opens the scoring against Santa Fe. These kids had a great tournament!! 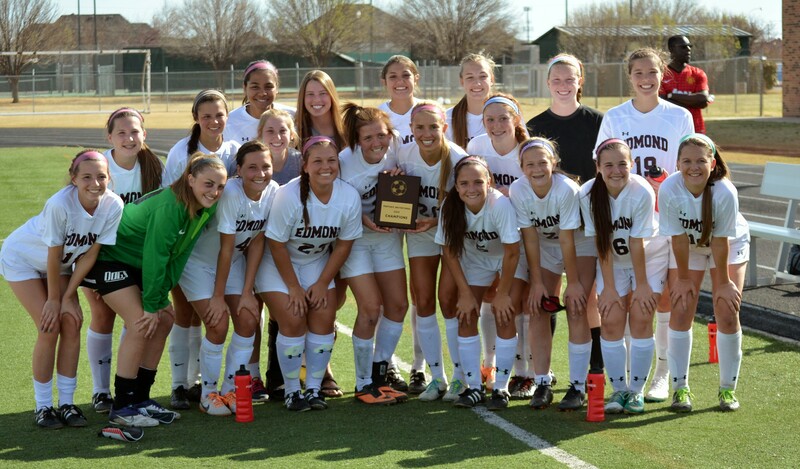 Next up was our east side neighbors Edmond Santa Fe. We played great and won this one, turns out we split our regular season games with the sister schools. We were able to find success without one of our leading scorers who really did a number on her ankle (missed 6 weeks) and one of our top defenders who broke her leg (missed the entire season, but was ready for the playoffs). We entered district play riding a four game winning streak and starting to really come together. One of the biggest concerns the coaching staff had at the beginning of the year was senior leadership and who could step up to score some goals. As it turns out, our seniors were taking great strides in learning to be great leaders and we solved the goal scoring problem by turning lose one of our sophomore players – who is primed to have an excellent junior season. In Oklahoma to qualify for the play-offs we need to finish in the top four in our district and as it turns out, we had one of the toughest districts in the state! 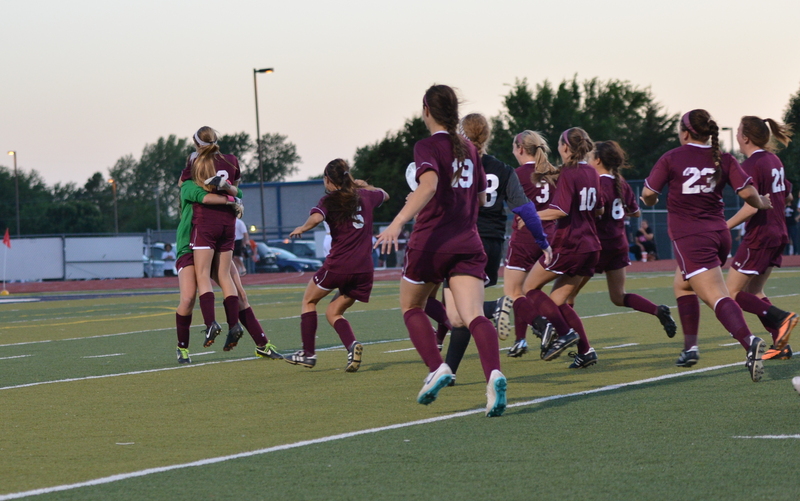 We survived in a penalty shootout against Mustang, lost in overtime against Norman North, then proceeded to win the next five games in a row to finish second in our district and host a first round play-off game. The opening round of the play-offs had us paired up with our sister school Santa Fe, part 2 as is were…We put together an excellent game and earned our ninth shut out of the year! Next stop, the other side of Edmond for part 2 against North. Celebration time!! We won this game on the 20th shooter in penalties! This game had it all!!! We took the lead, gifted them a goal to be tied at halftime, scored early in the 2nd half and gave up the tying goal with 18 seconds left in regulation. Two 10 minute overtimes and it was onto penalties: this game was won on the 20th penalty shot! The most unbelievable shoot out I have ever seen or been part of. WOW! Ok – take a deep breath – we are in the State Semi Finals for the 2nd time in three years and our task is to figure out how to beat the hottest team in Oklahoma: Tulsa Union. Yet another huge win! What a game!! All they did was run through the entire season undefeated, laying waste to all in their path. A tall order for a team that consistently plays seven freshman and sophomores on the field at the same time. How would these girls manage? Turns out, they manage pretty well! We scored two goals early in the first half and held onto the lead for a HUGE 2-1 victory!! Seeing the scoreboard at the OU Soccer Complex was really cool!! Final stop this year was the State Finals – we were making a return trip for the first time since 2004 and trying to win our first title since 1990. What an exciting day!! 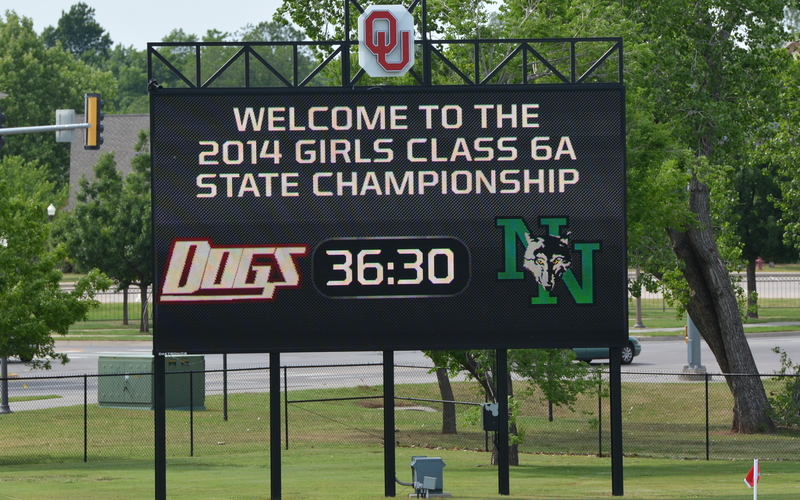 Turns out we were playing Norman North again and….They totally outperformed us this day. Hats off to them – they were spot on as they won their first soccer title. As disappointed as I was in the final result, I was so excited for the season that the ladies had put together. They overcame injuries, they stayed strong, they worked their tails off, they never, ever, ever quit or gave up. These characteristics are so important for their future and yet these girls are showing everyone that they have a head start on making them a fabric of their lives. DJ, who did not play a minute all season because of a broken leg, never missed practice, cheered every game like it was her last, coached her defenders when they came off the field and showed that no matter her circumstance – she was going to be a positive contributor. Amanda comes up with a severe ankle sprain in practice and misses several games before she can get back on the field – but she never quit working either. She was vocal from the sideline and encouraging to those around her. Nina recovers from a knee injury in time to play just a couple of games before season ending knee surgery on her other knee takes her out. But she never quit! She was at everything!! Riley really does a number on her knee, so badly that she will be in recovery for quite awhile. But as soon as she was able to get back on the sideline she did! I love the way these girls took adversity and made it theirs. They never stopped trying, cheering, believing! Our team as a whole this year was really special and I am so thankful for the memories created. I know that looking back – wow! These kids were blessings to me in ways they will never know and for that I am thankful. 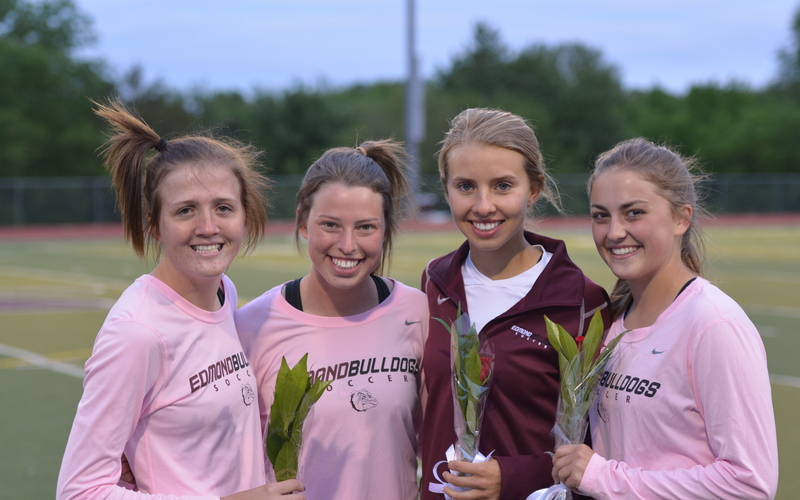 I wish our four graduating seniors the very best of luck: Amanda, Reagan, Lana, and Carly – you guys have had the most amazing high school careers – you have experienced the depths of a season gone wrong to the highs of reaching a state championship. Thank you for being who you are and for doing all that you have for this program. You will be missed!! And for all the rest of you girls – don’t forget how hard you had to work this year, don’t forget the joys and the pain, don’t forget the frustration of the state finals, and mostly don’t forget how you did it. You worked as a team, you cheered each other on, you pulled each other up. You will have to do it again and be even more focused next year – you will have a big target on you back. No more surprises. Accept this challenge and BE AMAZING! Work hard this summer, play hard with your clubs, get better and get ready for the ride that is coming up next spring.